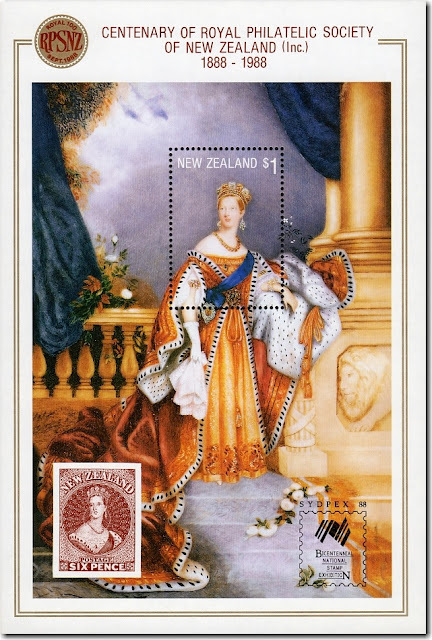 During the 1880s New Zealand stamps were few and far between - only a handful, all bearing the portrait of Queen Victoria, had been issued. 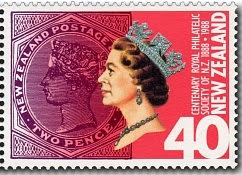 On 5 September 1888, four collectors met to discuss their hobby; the outcome of the meeting was the Philatelic Society of New Zealand, the nation's first organised stamp collectors' group. 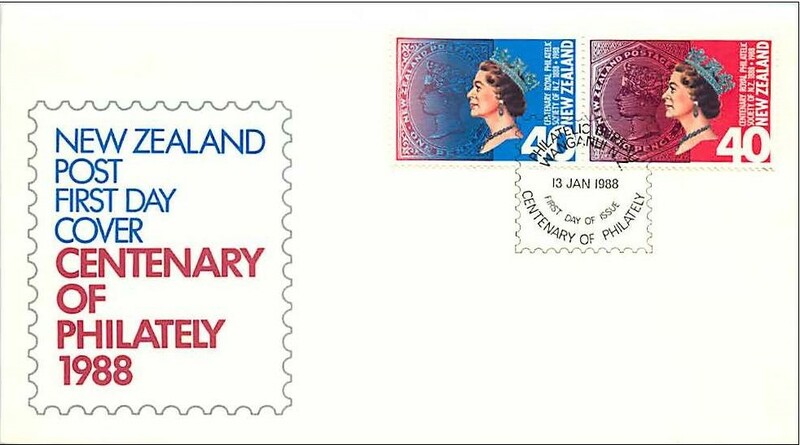 Today the Society, now the Royal Philatelic Society of New Zealand, is far bigger, one of the leading philatelic societies in the country and is affiliated to the country's national philatelic body, the New Zealand Philatelic Federation. 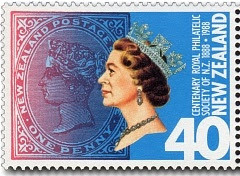 To mark 100 years of organised philately in New Zealand, the Society organised the "Royal 100" national philatelic exhibition, held in Wellington in October 1988. 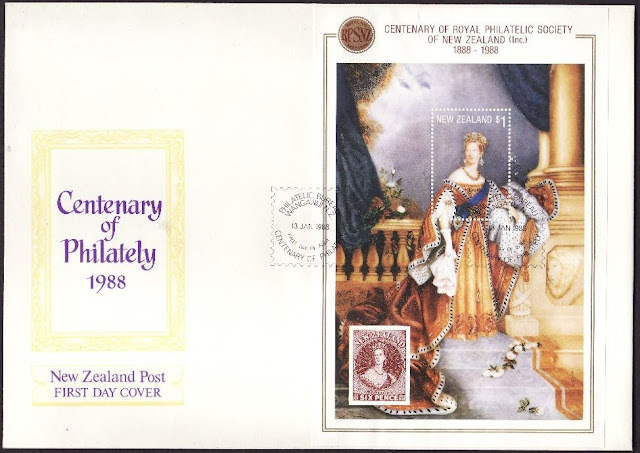 New Zealand Post issued two stamps marking this 100 year period. Queen Elizabeth II is set against a background showing stamps from the 1882 Second Side-Faced Issue, each with the portrait of Queen Victoria. Foreground: - 40c - Blue Queen Elizabeth II. Background: - 1d - Red Queen Victoria - 1882 Second Side-Face Issue. Foreground: - 40c - Red Queen Elizabeth II. Background: - 2d - Purple Queen Victoria - 1882 Second Side-Face Issue. Yes, I did mean sheets, three of them. First is the sheet created for this issue, then is the overprint for the Royal 100 National Philatelic Exhibition, and finally, an overprint for the Australian Bicentennial Philatelic Exhibition - Sydpex '88. 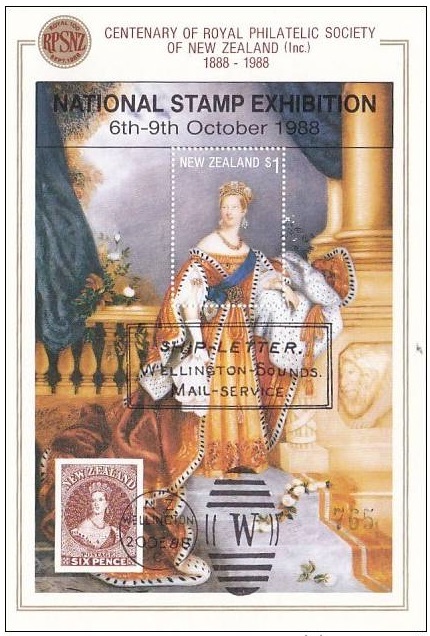 A commemorative miniature sheet, also issued at the same time as the two stamps, includes a one dollar Queen Victoria portrait stamp, only available from the miniature sheet. The miniature sheet depicted the 'Chalon' portrait of Queen Victoria - part of this portrait formed the vignette on New Zealand's first stamp issue in 1855. One of which, a 1859 6d (brown) Full Face Queen Victoria stamp, is shown in the bottom right corner. Miniature Sheet - First Day Cover. The 1988 Centenary Philatelic Society of New Zealand Miniature sheet was also overprinted for the Australian Bicentennial Philatelic Exhibition - Sydpex '88 which was held in Sydney.